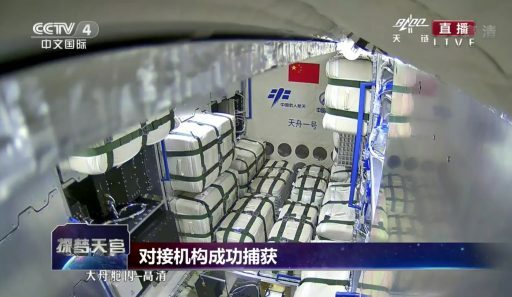 China’s Tianzhou-1 cargo resupply spacecraft completed an express link-up with the unoccupied Tiangong-2 space laboratory on Tuesday, continuing a shakedown mission to pave the way to an operational cargo architecture for the upcoming Chinese Space Station (CSS). Furthermore, Tuesday’s re-docking practiced a fast rendezvous scheme that could enable Chinese crews to reach their orbital destination within hours of launch once the CSS is up and running. The 13-metric ton Tianzhou-1 ‘Heavenly Vessel’ has been in orbit since a flawless launch atop a Long March 7 rocket on April 20, beginning a planned five-month demonstration mission. Guided by a radio-and-laser navigation system, Tianzhou-1 arrived in the vicinity of the Tiangong-2 space lab two days after launch, completing a successful docking with the empty space laboratory that had hosted a crew of two for China’s longest human space flight to date in October & November of 2016. After arriving at Tiangong-2, the TZ-1 cargo vessel demonstrated a five-day refueling sequence to top up the space lab’s tanks and show China had mastered the principles of fuel transfer in zero-gravity – a major requirement for the operation of a large modular space station which will require periodic top-ups of its tanks to maintain its orbit and keep it in a stable orientation. A second refueling campaign was completed in June to demonstrate the repeatability of the transfer before TZ-1 undocked on June 20. 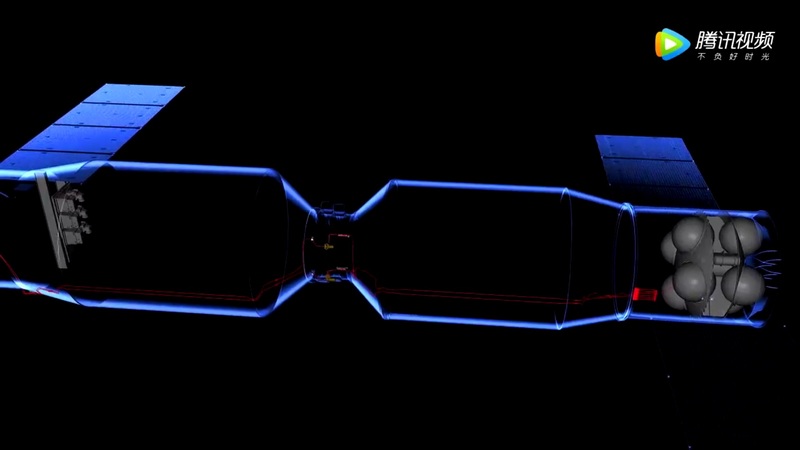 Engaging in an orbital dance, TZ-1 pulled away to a distance of five Kilometers where it entered an orbital parking spot for 90 minutes, then flew a 180-degree lap around TG-2 while the space lab also did a 180 to keep facing its docking mechanism toward the cargo vessel for re-docking after five hours and 18 minutes. On June 21st, Tianzhou-1 undocked once again to embark on a 12-week free flight to demonstrate the spacecraft could linger in orbit for extended periods of time. While the two were apart, Tiangong-2 performed one orbital maintenance maneuver in late June to remain in its operational orbit around 390 by 393 Kilometers in altitude, inclined 42.8 degrees. 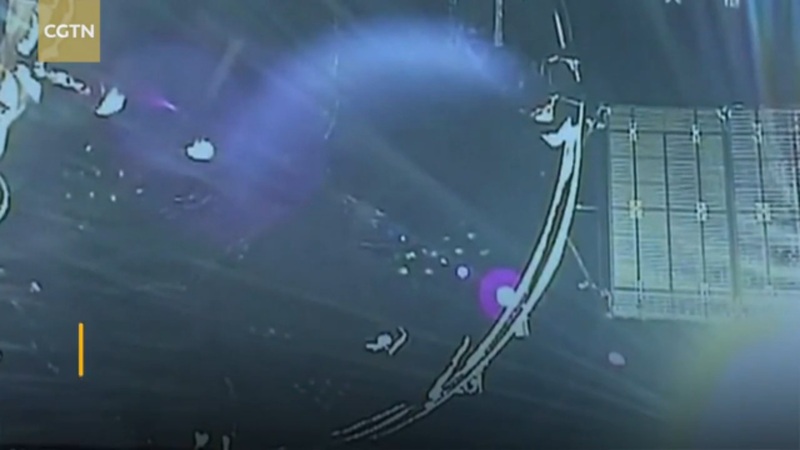 The Tianzhou-1 spacecraft maneuvered into a slightly higher orbit after undocking and also maintained an altitude near 395 Kilometers for the duration of the lengthy free flight. While in free flight, both craft carried out different science experiments with Tiangong-2 re-powering a suite of Earth and Space Research sensors and Tianzhou-1 exploring the physics of fluid phase change mechanisms in the absence of gravity, testing out a high-precision electrostatic accelerometer, examining the characteristics of non-Newtonian gravitation and supporting the development of an innovative medication that could reduce bone loss encountered by astronauts in space and help treat bone-loss diseases on Earth. 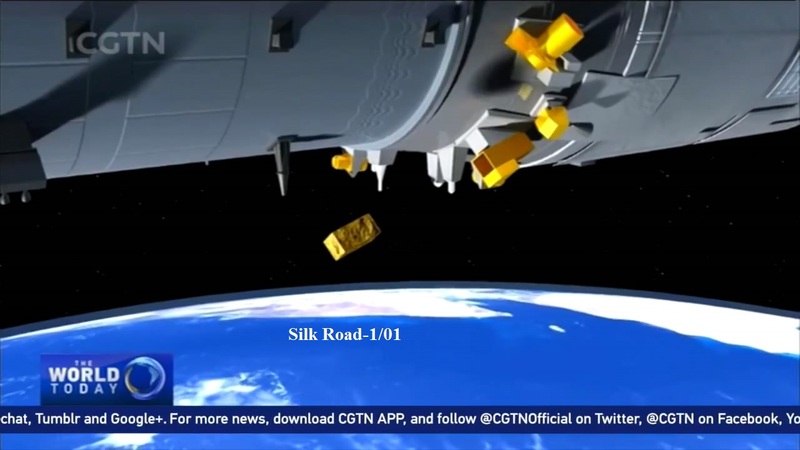 A 7:03 UTC on August 1st – 103 days into its mission, Tianzhou-1 released the Silk Road-1 CubeSat into orbit. This marked the country’s first deployment of a CubeSat by an orbiting host spacecraft, the official Xinhua news agency noted. The deployment was also intended to lay the foundation for China’s future space station to launch micro and nano satellites, similar to the International Space Station’s satellite deployment architecture. Silk Road-1, a 3-Unit CubeSat around 10 x 10 x 30 centimeters in size, weighs 4.5 Kilograms and was designed by the Xi’an Institute of Surveying and Mapping in cooperation with the Chinese Academy of Sciences. The small Earth-imaging satellite is completing a pathfinder mission for a future constellation of around 30 satellites capturing remote sensing data in a variety of wavelengths to create a responsive, rapid-revisit Earth observation capability based on inexpensive CubeSats. On Tuesday at 9:24 UTC, Tianzhou-1 initiated its re-rendezvous with the Tiangong-2 target vehicle – employing a fast-track rendezvous scheme to demonstrate a flight profile to be used by future crewed Shenzhou missions to carry crews to the Chinese Space Station within a few hours of launch, as opposed to the two-day rendezvous scheme used on China’s three previous crew missions to the Tiangong-1/2 space vehicles. Through a series of engine burns, Tianzhou-1 maneuvered into the vicinity of TG-2 – entering the relative navigation phase of the rendezvous at a distance of around 52 Kilometers when the radio and laser-guided navigation system came into action – using a UHF radar for the far-field rendezvous before the optical system went active at a distance of five Kilometers. 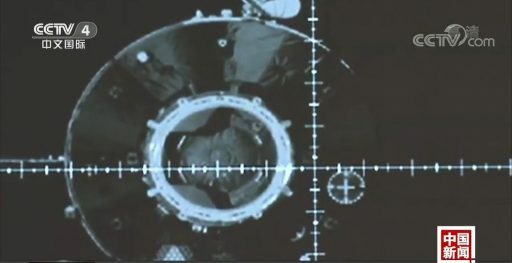 Per the usual rendezvous procedure, TZ-1 was to automatically pause its approach at 400, 120 and 30 meters, using a smart computer logic to judge its own position within the approach corridor and making necessary corrections before continuing with the approach. 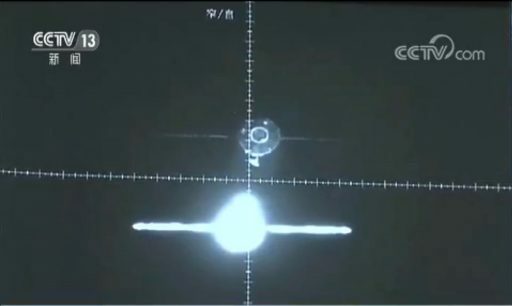 Firing its maneuvering thrusters at 30 meters, Tianzhou-1 initiated a final approach – aiming for a contact speed of 0.2 meters per second. 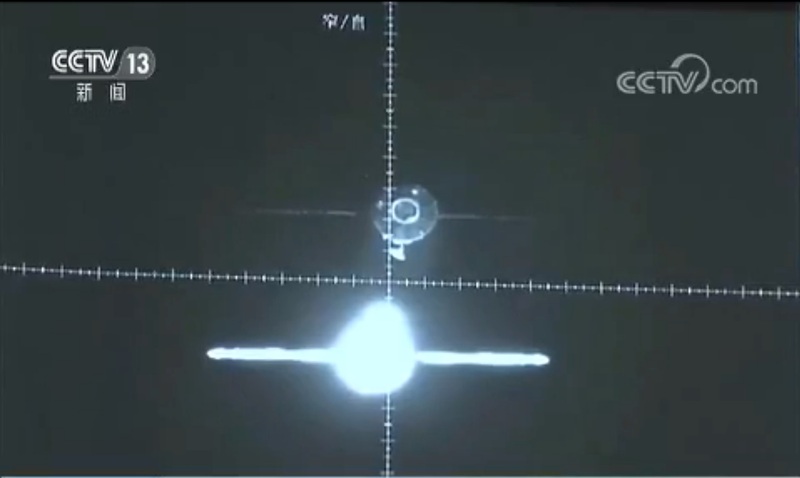 Docking was confirmed at 15:58 UTC and subsequent operations included forming a hard mate between the APAS-based docking mechanisms to create Chine’s largest orbiting complex to date, measuring 21-meters in length. 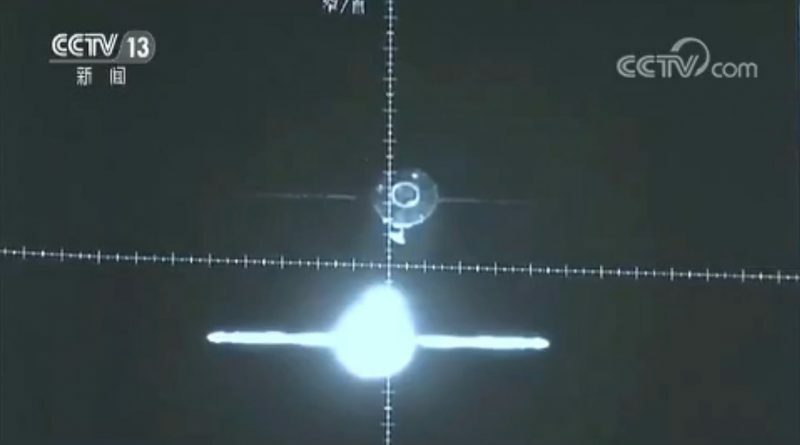 This third docking between the two vehicles is planned to be their last. 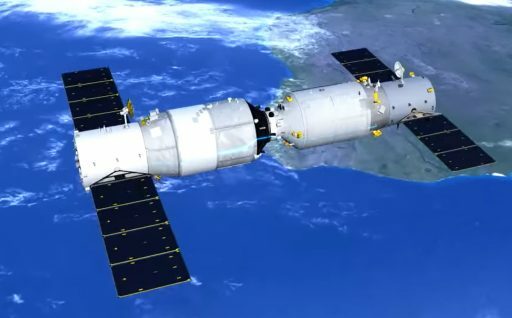 A third re-fueling test is expected to commence soon to top up Tiangong’s tanks to enable the craft to remain in orbit for an extended mission to test the longevity of China’s space station systems and employ a suite of Earth and Space Science Sensors to collect data. Tianzhou-1 is expected to depart Tiangong-2 after the refueling and enter a brief free flight ahead of a targeted deorbit burn to set up for a destructive re-entry over the Pacific Ocean where various spacecraft have found their final resting place, including the majority of ISS cargo vehicles. The Tianzhou-1 mission – so far a resounding success – is the final precursor to the launch of the Tianhe Core Module of the Chinese Space Station that is targeting a 2019 liftoff on China’s Long March 5 heavy-lift rocket, to be followed by two large science modules called Wentian and Mengtian. Whether the recent failure of Long March 5 will impact the CSS schedule remains to be seen. The first stage engine problem on the July 2 flight has thrown the Long March 5 manifest into limbo with China’s Chang’e 5 lunar sample return mission facing a lengthy delay as additional test flights of the new rocket are desired before placing a high-profile payload – like Chang’e or Tianhe – on the large carrier rocket.